Cooking from a CSA, Part Six: What do I do with all these scraps and extras? Let’s go back to the end of last week. You might remember that I was feeling a little discouraged because I didn’t get through all the vegetables and ended up throwing some stuff out. This week I again had the same problem—I just couldn’t get through everything, especially since I didn’t cook that much over Memorial Day weekend. I hate wasting food, and I’m throwing out a ton of ends and outer leaves that would be great for something like composting or juicing or making stock. So I sat back and looked at my options. Composting is out, because I don’t have any use for compost or space to do it on the scale I require for the amount of scrap veggies I’m producing. I could keep scraps and take them out to my parents’ to compost there, but it seems kind of pointless, personally. If I did have a yard, or even a patio/balcony garden, this would be a great option. I seriously considered buying a juicer this week. I must have read about thirty different juicer reviews and talked to a half dozen people about their juicers this week. I love fresh juice, and I actually did a modified juice/raw diet for about a week earlier this year—not really as a weight loss plan, but because I just felt lousy after all the junk I ate over the holidays, and it was a good way to cut myself off from the bad habits completely, give my system (which was feeling overtaxed) a break, and think carefully about everything I was eating. It helped me get my eating habits back on track. But I’m not considering it as a lifestyle change, and I normally like to eat my fruits and vegetables instead of drink them. Also, I would end up spending a lot of money on fruits and veggies to make ideal juice combos—I don’t get many fruits in my CSA box and I don’t like many straight vegetable juices. Plus, a quality juicer is pretty expensive and there are other items I’d rather buy (a nice digital camera springs immediately to mind!). So, a juicer an option I might consider in the future, but I’ve ruled it out for now. So, for now, I’ve settled on making vegetable stock as the best option for my CSA leftovers and scraps. I actually started this week by throwing a bunch of my leftovers (mostly lettuce, radishes and other salad goodies) into a freezer-proof tupperware container and throwing it in the freezer. As the week goes on, I’ll add more scraps—and I should have great stock-making scraps this week, since I just received carrots, leeks, green garlic, and plenty of other great vegetables. It’s important to note that I’m only saving stuff that is still fresh and has been cleaned to the bin. No past-their-prime veggies—as Vegan Yum Yum points out here, that’s probably why many commercial veggie stocks taste so bland. Expect an update when I make the first batch. My favorite meal this week was born of necessity. I was one day away from the next CSA delivery and had a pile of vegetables left to use. One of the easiest ways to reduce a mass of greens is to cook it, so I cleaned three bunches of greens, added some turnips and veggie sausage, and tossed it with some pasta. Quick, easy, and really delicious. The variety of greens adds a lot of subtle flavor, and the veggies sausage (Yves Italian variety, I believe) added some nice spice. Put a large pot of water on to boil for the pasta. Cook the pasta as directed, but add the spinach and arugula for the last 2 minutes of cooking. 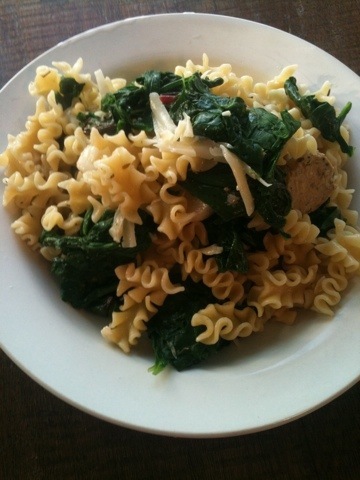 Just pile it right on top of the pasta and water, and swirl it with a spoon. Then, drain the contents of the pot in a colander and put in a large serving bowl. While the pasta is cooking, heat olive oil in a large skillet on medium-high heat. Add the veggie sausage and turnips, and sauté for about five minutes, until contents start to lightly brown. Add chard, garlic and seasoning to the pan, and stir. Cook about 5 minutes, until chard is slightly wilted but still has some body. Remove from heat. Add sautéed ingredients to the pasta mixture, and stir. Serve immediately.